All the prizes we collected over the whole year. Black Friday we got a lot, then end of holidays grabbed up the deals. And of course dollar store for the win! Over the years as a Girl leader I have tried a number of different unique ways to run events and/or meetings to make it more exciting for the girls. One year I turned every meeting into a theme, sometimes just having girls dress up other times we did games and activities around that theme. How do you mix up your meetings and add a little more excitement? 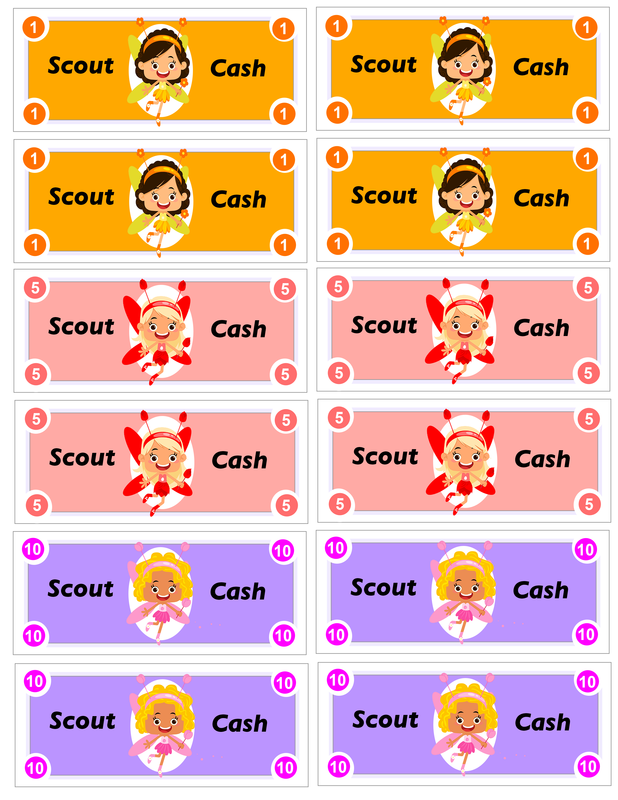 Below I will cover ways to use Scout cash as a incentive to participate in activities, help out at meeting, and other tasks you decide to use scout cash for. The girls in my troop earned it for everything they did, if they follow directions and complete what is expected,(responsible what I say and Do) example turn all forms in on time, be on time for meetings/events, sell at a cookie booth, and both product sales or participate in the service projects. We would also give bonuses for top sellers in both fall products and cookies. We also had a family bonus set up, top families receive same bonuses, we felt that it isn’t really being (honest and fair) that one girl can sell 200 boxes but a family of 3 would have to sell 600 boxes for each girl to get the incentive. Our council used to take that in to account but they stopped a few years ago so we felt on troop level we should continue it. 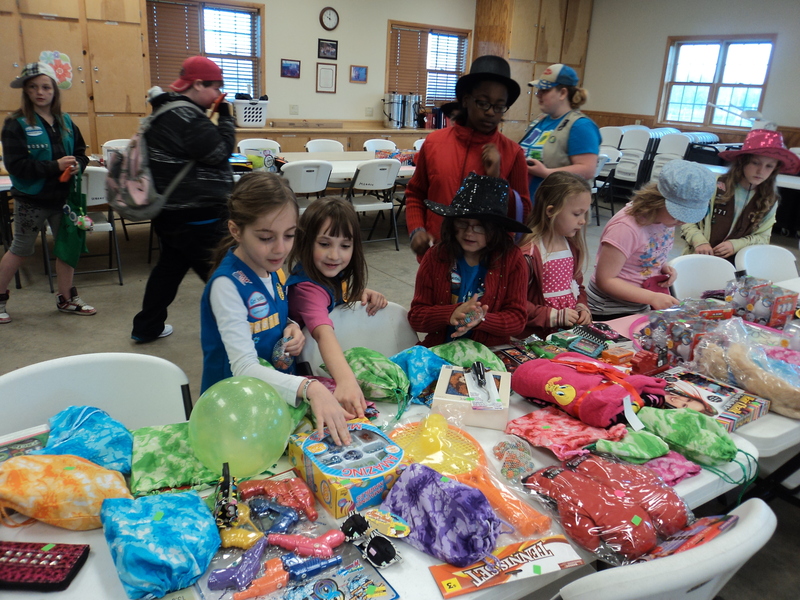 The girls collect scout cash all year and then we have auction type event at the end of the scout year. I pick up sale items all year long even go out on Black Friday to pick up great deals for the auction. Other leaders if they find something at a great price they also pick up stuff. Some girls have made like 400 dollars for all their effort while another girl may only had earned $200 for the year. We do not let the girl with $400 go up and buy everything we draw for who goes up and they can only purchase one item at a time so if that girl that has $400, (priced items from $300 and down to $1) buys something for $300 she will only have $100 left for shopping later, this teaching the girls how get the most out of their money. Once every girl and leader (we had an adult table) got to go through once we started all over again. Some girls bought many things because they used their money on the lower cost tables it was very interesting how the girls planned their money out ended up being educational. The girls voted and we continued this year after year. TO make it fair for girls who did not attend we took away half of there cash so they could use it next year at the same event. This past year we added a above and beyond table for girls who went above what was expected. For example we asked everyone to sell 10 fall products and girls who went above that and sold 20 or more got a above and beyond ticket, perfect attendance, helping clean up without asking, helping another girl, the list goes on. We had these tickets that we handed out at each meeting. I am not telling you that you need to bribe your girls to do a good job and live by the GS law, there are times we wouldn’t even give tickets, and girls would step up and do things without being asked. We did this because just like us adults girls love incentives, earning things, getting rewarded for doing things. IT WAS JUST PLAIN FUN! I highly recommend this it has been a great success your money can be printed above or create your own. Are you a new K – 1st grade leader? If you are interested in saving a lot of time planning your troop meetings and looking for a fun new way to help your girls earn their petals and promise center, check out the GARDEN FAIRIES: ADVENTURE Activity Kit. Learn more about kit and get yours today! This is something that I have been wanting to implement for a while. Especially to get the girls motivated to wear their full uniform. Thanks for the ideas! How much actual money do you spend on items and What do you with the leftovers? Hi Heather, we have spent between $300 – $500 depending on what girls voted on, we usually do a fundraiser that funds go to the cause of scout cash prizes. Now our group also had 40 girls in it so remember that as well. As for left overs after everyone spent what they wanted to spend. We pack it away and the following year bring it back out and put with the new stuff we bought. Now the last year we did this the girls wanted to do something different the following year we put together baskets and donated to a local shelter where there were a lot of kids.